Steven Johnson’s article “The Creative Apocalypse That Wasn’t” frames itself as a data-driven response to concerns about the plight of creative workers in the digital age. But Johnson’s grasp of the limitations of the data he cites seems tenuous, and he ends up relying on some very dubious and all-too-familiar assumptions. In its sweeping dismissal of artists’ various concerns, the article reads as an exercise in gaslighting. This is extra disheartening, because in our previous experiences with the NYT’s journalists and fact-checkers, we’ve found them to be rigorous and fair. Likewise, we’ve found Johnson’s books and TV work to be entertaining and often insightful. We’ll focus our criticisms on Johnson’s thoughts about musicians in this piece, but it’s worth noting that friends in other creative industries—film and publishing—have also reached out to us noting similar objections about Johnson’s coverage of their fields. On both questions Johnson seems to fail to fully comprehend the limitations of the datasets that he uses, and the heterogeneity of the musician population. Oddly, he repeatedly seems to nod toward these complications and then proceeds to essentially ignore them. The O.E.S. data goes back to the 1980s, though some of the category definitions have changed over time. This, and the way the agency collects its data, can make specific year-to-year comparisons less reliable. “Although the OES survey methodology is designed to create detailed cross-sectional employment and wage estimates for the U.S., States, metropolitan and nonmetropolitan areas, across industry and by industry, it is less useful for comparisons of two or more points in time. Challenges in using OES data as a time series include changes in the occupational, industrial, and geographical classification systems, changes in the way data are collected, changes in the survey reference period, and changes in mean wage estimation methodology, as well as permanent features of the methodology. Johnson writes, “According to the OES, in 1999 there were nearly 53,000 Americans who considered their primary occupation to be that of a musician, a music director or a composer; in 2014 more than 60,000 people were employed writing, singing, or playing music. That’s a rise of 15 percent.” Let’s look at those years of topline data in full. Johnson writes,“According to the O.E.S., songwriters and music directors saw their average income rise by nearly 60 percent since 1999.” Johnson here forgets his earlier observation that OES categorization can be overly broad. A full 55% of the people included in this category (actually called “Music Directors and Composers” and carrying the following description: conduct, direct, plan, and lead instrumental or vocal performances by musical groups, such as orchestras, bands, choirs, and glee clubs. Includes arrangers, composers, choral directors, and orchestrators”) in 2014 are elementary or secondary school band/choir/orchestra directors; certainly an important part of the music ecosystem, but probably not the best proxy for say, a professional songwriter or a classical composer, let alone for the plight of musicians generally. Note also that Johnson seems to move back and forth between looking at the two OES categories individually or pooling their numbers, depending on which approach better supports his thesis. Beyond that, remember that average wages don’t tell you anything about the distribution. Again, musicians are a heterogeneous group and a small handful of extreme outliers (not uncommon in music) can radically distort an average. Average income can stay the same as distribution changes radically over time. From 2002 to 2012, the number of businesses that identify as or employ ‘‘independent artists, writers and performers’’ (which also includes some athletes) grew by almost 40 percent, while the total revenue generated by this group grew by 60 percent, far exceeding the rate of inflation. Johnson doesn’t specify here what study he’s pulling from but our best guess is that it’s the US Economic Census. (update 8/23: though it’s not the Economic Census’ spinoff, the SBO (Survey of Business Owners) as we originally suspected when we first posted this Friday; our thanks to the Census Bureau for helping clarify). The bureau offers some warnings about methodological changes and categorical changes over time with the Economic Census similar to the OES. But Johnson also omits that this same study found that the number of paid employees working in that category declined from 58,828 to 41,117, a decrease of 28%. For many populations, there are commonly-understood criteria, or demographic characteristics, or certifications that make this sorting process relatively easy. But unlike – say – doctors or lawyers, there are no formal exams for musicians to pass, nor accrediting organizations to join. There is nothing stopping a young guitar player from declaring herself as a “musician”, packing up the van and hitting the road, nor is there any formal accreditation needed for an eager wordsmith to hang out his shingle as a “songwriter”. And of course, many musicians have day jobs, and some don’t even bother reporting their music-related earnings, meaning again that the data is incomplete. This leads us to conclude, as we’ve said before, there is no reliable way to measure the size of the musician population. Anyone who tells you they know for sure has an agenda. It’s true that most of that live-­music revenue is captured by superstar acts like Taylor Swift or the Rolling Stones. In 1982, the musical 1-­percenters took in only 26 percent of the total revenues generated by live music; in 2003, they captured 56 percent of the market, with the top 5 percent of musicians capturing almost 90 percent of live revenues. But this winner-­takes-­all trend seems to have preceded the digital revolution; most 1-­percenters achieved their gains in the ’80s and early ’90s, as the concert business matured into a promotional machine oriented around marquee world tours. In the post-­Napster era, there seems to have been a swing back in a more egalitarian direction. According to one source, the top 100 tours of 2000 captured 90 percent of all revenue, while today the top 100 capture only 43 percent. Johnson doesn’t cite the sources of his data in this paragraph. As best we can tell, the account of 1982-2003, and musical one-percenters, comes from Princeton economist and White House advisor Alan Krueger. As best we can tell, the claim of a “swing back in a more egalitarian direction” references a report by a “media strategist” named Liam Boluk. Both Krueger and Boluk appear to take their data from Pollstar. Pollstar works hard to generate good data, but their dataset is always going to be incomplete. That’s because it consists of voluntary submissions by venues and concert promoters. Some promoters, including the world’s number one promoter LiveNation, have chosen, at least some of the time, to withhold reporting data from PollStar for competitive reasons. (Pollstar’s 2014 data also included nine different productions of Cirque Du Soleil!) Some event producers, like operas and symphonies, jazz clubs, etc, don’t typically submit their data to Pollstar because they’re not really competing in the market that Pollstar covers. Many smaller/grassroots venues might not see any benefit in reporting to the magazine (and in some of these venues, bands are struggling to make it work on the same five-dollar cover charge as in the 1980s). Overall growth in the live marketplace as measured by Pollstar’s data could be attributed to rising ticket prices, more shows, or simply more venues reporting that did not report before. (Krueger offers a lenghty explanation of his attempts to account for the limitations of Pollstar’s dataset , but Boluk provides none.) That amounts to a weak case for the democratization of live revenue. That weakness is compounded by the fact that gross revenue numbers in any part of an industry tell you nothing about how individuals working in that industry are faring. As ticket prices climb, so do production costs and audience expectations. Touring costs are never reported publicly. Usually the only people who know about the cost side are band members and—if they have them—their booking agent, their manager(s) and/or their accountant. Sometimes, even well-attended tours—even the expensive tours that drive massive Pollstar grosses—actually lose money. Gross tour revenues tell us nothing about how much of that gross actually ends up in artists’ pockets. And nowhere does Johnson address the costs of touring (which is curious, as he’s quite eager to mention the decreases in costs of recording and distribution). And, unlike revenue streams derived from making recordings or compositions, touring costs aren’t very scalable. The more shows you play, the more money you have to spend. But Johnson misses a lot in reducing this question to artists’ personal preferences, a matter of whether they “like” being on the road.. Some artists’ ability to tour is limited by health, age, and whether they have kids. Some, like professional songwriters, session players, etc, are just working in a different part of the industry. Are musicians making more or less from touring? 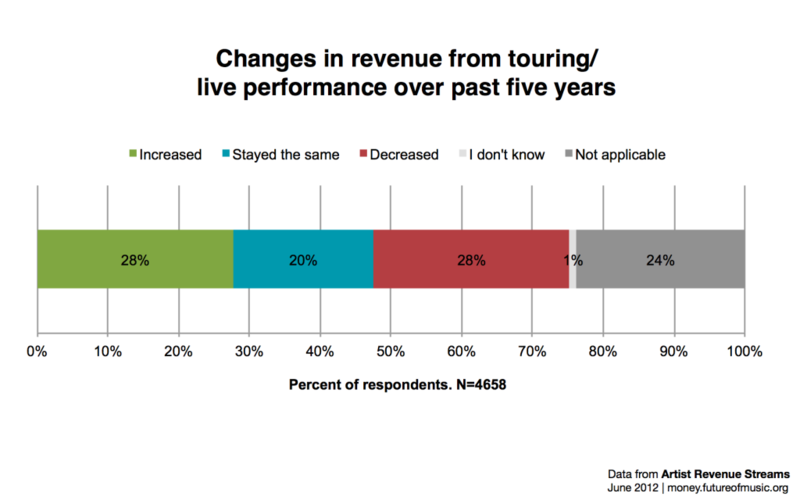 In 2012, we asked musicians whether their gross revenue from touring was up or down over the past five years. It was an even split. For 28%, their income from live performance has gone up. For 20%, it has stayed the same, and for 28% it has gone down over the past five years. Johnson notes FMC’s research identifying new revenue streams, but fails to note that we point out that not all musicians have access to these new streams, and not all new revenue streams are going to produce meaningful income for those who participate in them. For example, sync licensing—where revenue is generated when an underlying composition and/or sound recording is attached to a visual product, like a movie, TV show, advertisement or video game—is important for some music creators, but it isn’t a magic money machine. Nor is it new income, as Johnson weirdly suggests—syncs are as old as television and motion pictures with sound. Sure, there are new opportunities like online advertising, video games, web series and the like, but it’s also a very competitive market, and an artist’s mileage will vary. As will their take-home: musicians and composers who retain their copyrights are in a position to make the most money from syncs, as there are no labels or publishers to take a cut. However, that also means that they have to do all the pitching themselves, which can be time and labor intensive, and dependent on relationships with music supervisors. Success here depends on a number of factors, from a track’s “replaceability” to the rightsholder’s negotiating skills. And not every musician is making work that’s appropriate for sync placement. So, while syncs can represent an important revenue stream for musicians and composers, it’s hardly a panacea for challenges in monetizing music. There are other problems. Johnson writes, “The vast machinery of promoters and shippers and manufacturers and A&R executives that sprouted in the middle of the 20th century, fueled by the profits of those high-margin vinyl records and CDs, has largely withered away.” Here again, Johnson steps away from data and toward conventional wisdom. There are probably fewer A&R jobs and physical media doesn’t do the numbers it once did (though physical sales did account for $6.82 billion in 2014 according to IPFI—nothing to sneeze at!) But in our digital age, promoters are certainly as active a part of the music landscape as ever (ask any music journalist and she’ll point to her overflowing inbox). Social media tools may allow some kinds of musicians more direct connections to potential fans. But again, remember that these tools are not relevant to every kind of musician. The debate today is structural, but it’s not just about whether art will make money, but whose art, what kind of art, and how much of the money generated by art ends up with artists, and what they’ll have to endure to get it. It’s about how much agency artists get in defining the terms of the digital landscape. It’s coming from artists who hated Napster passionately and artists who really had no problem with unauthorized file sharing. It’s coming from artists who’ve recorded for major labels, indie labels, or no label at all. If you want to know how musicians are faring, you have to ask musicians, preferably a whole lot of them. You’ll get different answers from different musicians, and they’ll all be correct in terms of their own experiences. But your overall understanding will better reflect the complexity of the landscape. Submitted by rick carnes (not verified) on August 22, 2015 - 11:35am. Would that the NYT was as diligent in there pursuit of the truth. in proving Mr. Johnson's thesis. Submitted by 504more (not verified) on August 22, 2015 - 12:04pm. Total U.S. population growth alone would account for the alleged increase in the number of musicians. A 13% increase reported in the number of musicians from 1999 to 2014 corresponds roughly with a 10% total population increase in the U.S. from 2000 to 2010 according to US Census population counts. So duh - without even going into the rest of the detailed takedowns that follow. Johnson's article, and the NY Times editorial staff, ought to be spanked for such childish research splurged out across the world for all to see. Submitted by Steven Johnson (not verified) on August 24, 2015 - 6:12pm. I’ve written a more general response to this post, which we have just published on the Times site, explaining why we disagree with the Future Of Music’s objection to the data included in the piece, and with the way their post characterizes my piece’s overall argument. But I wanted to respond specifically to the factual claims as well, for those who want to dig deeper. For what it’s worth, we made a number of changes to the final version of the piece based on the input from the FMC, but stand by our decisions to use the data we included in the final version. I went back and forth on this one for a while, and had a detailed exchange with the OES people to try and get some clarity on the numbers. The best explanation I have from them is that there is some kind of definitional change that happens in the late 2000s that is probably pulling people from one music category to the other, though admittedly it seems to happen at different time frames. So in this case, I could have told a story from the most optimistic point of view: songwriters and directors had 250% job growth! Or I could have told it from the most pessimistic point of view: musicians decline 16%. Given that at least some of the change came from moving people from one camp to the other, it seemed most responsible to split the difference and report the number for the overall music group, since that is after all the general category the piece is concerned with. Johnson writes,“According to the O.E.S., songwriters and music directors saw their average income rise by nearly 60 percent since 1999.”… Note also that Johnson seems to move back and forth between looking at the two OES categories individually or pooling their numbers, depending on which approach better supports his thesis. First, we had to use one of the categories, and not pool them together, because you can sum up the jobs in both categories, but we didn’t have the data to sum up the wages. But in terms of cherry-picking the data to make the argument stronger, this is actually the exact opposite of what we did. Of the many possible ways of framing the data, we actually chose the less optimistic scenario. As I mentioned in the Times response, the OES data has median wages for musicians starting in 2004, and in the ten years since then, those wages have outperformed the overall job market by more than 50 percent. (In other words, more optimistic than the story we told with the composers.) Throughout the piece, if we had a choice between two or three different ways of framing the data, we erred on the side of a less optimistic framing. Beyond that, remember that average wages don’t tell you anything about the distribution. Again, musicians are a heterogeneous group and a small handful of extreme outliers (not uncommon in music) can radically distort an average. This is certainly an important point, but I dove into this very early in my research. For starters, the OES data breaks down its wages data by both median and mean. By comparing the relative growth rates of both entries, you can see whether extreme outliers are having a big effect on the growth. (In other words, if you see a huge spike in mean wages, but the median stays flat, that tells you that the numbers are being pulled up by the superstars, while “average” wages are lagging.) If you look at the mean/median breakdown for musicians since 2004 (again, when the data starts) the median grows by 35 percent, but the mean only grows by 30 percent, suggesting that, in fact, the high-earning outliers are pulling the overall average down. Another key fact in thinking about the impact of the superstars is the concert data from Pollstar. If you look at this report, you can see that overall ticket sales from 2000 to 2014 grew by 265 percent, but the gross revenue for the top 100 acts only grew by about 80 percent, suggesting that the economics of live music are becoming more equitably distributed. In the end, I didn’t feel confident enough to include this argument that the business was getting more egalitarian because, unlike overall jobs or income, we only had one or two statistics that suggested a trend, and the Pollstar data wasn’t exactly apples-to-apples. I didn’t include a reference to all the analysis we’d done on median versus mean, because I guess I assumed most readers would assume the Times (or I) wasn’t making 8th-grade statistics mistakes. Johnson doesn’t specify here what study he’s pulling from but our best guess is that it’s the US Economic Census’ SBO (Survey of Business Owners). The census bureau offers some warnings about methodological changes and categorical changes over time with the SBO similar to the OES. But Johnson also omits that this same study found that the number of paid employees working in that category declined from 58,828 to 41,117, a decrease of 28%. "That autonomy is reflected in the economic data in another way. The Economic Census reports that while the pool of creative workers is growing, the total number of people employed either full or part-time by those creatives has diminished since 2002. “Independent artists, writers, and performers” generated about 56,000 total jobs in 2002, but only supported about 41,000 ten years later. This might be a sign of Great Recession belt-tightening, but I suspect there are long-term trends driving that decline. The glib explanation is to say that the artists are doing better than ever, but the entourage is shrinking. Why should we care about the handlers and hangers-on? Yet I find this trend troubling, and not just because I am personally part of the problem. I wrote several research-heavy books in the late 1990s and early 2000s for which I hired a series of assistants who worked part-time for me for as long as a year. I learned a great deal from those collaborations, and I think they got something out of it too. I still think of those books as partnerships; recalling one of the books now inevitably conjures up the researcher who helped me write it. But the truth is what compelled me to hire those people in the first place was the fact that researching a complex science-history book in 1999 or 2003 still required a massive amount of legwork in libraries, not to mention typing up all the passages I had underlined in the books I already had in my study. But once Google began scanning the libraries of the world, and Amazon began releasing e-books where transcription was simply a matter of copy-and-paste, it stopped making economic sense for me to hire research assistants. It was more efficient and fun just to do it all myself. Imagine that balance sheet multiplied by a million: on the side of profit, I had more freedom to create, more control over my destiny, and a larger share of the income my work generated. And the convenience of online bookstores meant that I bought more books over the life of each project, thus supporting the livelihoods of other authors, instead of hiring a research assistant to xerox a few pages in the library. But I lost the intangible of collaborating with another human being, and a few of those human beings lost an interesting and (I hope) career-advancing part-time job. The ecosystem of creativity may well contract, as it becomes more efficient. That will likely be fine for the creatives themselves. But the jobs that lived at the borders of that ecosystem had value too." I stand by everything I say here. But it takes a lot of words to explain the distinction, and why it matters. We made a decision to focus the piece on the artists, not the ecosystem around the artists, and we had already included a reference to the ecosystem withering away, and so I think we made the right call in pruning this language. But it was a tough call for sure. I think it’s important to note that, contrary to the implications of the FMC post here (and their comments on Twitter) at no point in the piece do I imply that live music revenue has completely replaced lost recorded music revenue. I agree with the FMC that it’s very challenging to tell exactly what has happened here, given the complexity of contracts, touring expenses, etc. What the piece says is that if the musicians are on the whole doing slightly better than fifteen years ago, it is likely a mix of 1) increased concert revenue, 2) lower costs of production and distribution, and 3) new or expanded revenue streams. "[Fans] are willing to spend more on seeing [music] played live. They are willing to buy more ephemera and eager to establish a personal relationship to the people who make the music. Gig prices have escalated as a result. And the merchandise tables at gigs are universally teeming with activity. Back home, gigs that used to cost five or six bucks are now 20 or 30. Over here the ticket inflation has been more pronounced, with club gigs going for $80 or more. As a result gig income for bands has increased exponentially. My band has been playing a lot of the same places for the entirety of our existence, over 20 years now. I guess you could say we’ve saturated our audience, no matter how long we stay at it. Some of these perennial gigs are now paying an over of magnitude better than they were 10 or 15 years ago. That’s right, some places where we used to earn four or five hundred dollars we now earn four or five grand." Again, this is where it would have been entirely appropriate to include a line saying, “Some indie musicians report current revenues exceeding 10X the amount they received at the very same venue fifteen years before.” But as interesting as the Albini story is, we wanted to stick with our principle of not relying on individual anecdotes, and report only broader, industry-wide data. So we stuck to the baseline facts of ticket price increases and live music revenue trends. In the end, while we may disagree over the strategic value of assessing broad trends in the music business, we all share the belief that we need more transparency and more data, as David Byrne argued earlier this summer in another piece for the New York Times. It shouldn’t be so challenging just to figure out if musicians and songwriters are in crisis mode or not. No one is doing a better job fighting for that transparency — and for a more equitable economic system for musicians generally — than the Future Of Music. That is one fact I think we can all agree on. Submitted by kevin on August 26, 2015 - 11:07am. Stephen, we appreciate the detailed, thoughtful response and the kind words for our organization. That said, we stand by our critique. We'll have more to say shortly. Submitted by kevin on September 1, 2015 - 4:13pm. Submitted by Kid Charlemagne (not verified) on August 24, 2015 - 6:32pm. This data is really so meaningless...music teachers are not part of the problem with copyright and music devaluation. Some of us see the problem on a daily basis. All of the top session players I know are now on the road (for low wages) or playing Broadway shows. Recording engineers all out of work. My own catalog has been drastically devalued. Pros have been tossed out, and a flood of indie artists and amateurs have taken over. If you call that a growth in music directors, composers, DJs or whatever, it doesn't matter. Jobs data can be whatever you say, but it still may be cultural demise. Submitted by Robert Levine (not verified) on August 25, 2015 - 1:53pm. >>>If you look at this report, you can see that overall ticket sales from 2000 to 2014 grew by 265 percent, but the gross revenue for the top 100 acts only grew by about 80 percent, suggesting that the economics of live music are becoming more equitably distributed. How does this account for growth in the festival market? One of the most important trends in the concert business is the growth of festivals - which has little, if anything, to do with digital anything. Most people in the music business assume that festival attendance comes partly at the expense of other concerts. Would this depress the overall gross share of superstar tours? I'm not making an argument here, because it's hard to tell what affect the festival market has on anything - more artists get paid but those on top of the bill get much more. But I'm curious what this would mean. Also, I think one reason the concert business has grown so much is that bands don't retire anymore. This summer there were a few bands on 40th, even 50th anniversary tours. If you look back to 1975, how many groups that formed in 1935 were still performing? I'd suspect not that many. This is a cultural and demographic change that I don't think has much to do with digital music, either. Submitted by Nick (not verified) on August 26, 2015 - 11:06pm. One thing that should be compared are the current incomes from the bands that were promoted before and after 1999. In “Free Ride” Robert Levine pointed out that prior to 1999 record labels would often spend massive amounts of money (I think it was typically 6 or 7 digits..) to promote bands. And because of that promotional money from recording sales bands could tour and draw a crowd. And the promotional effect extends long after the promotional money is spent. If I mentioned The Rolling Stones or Nirvana everyone reading this would know exactly who they are because of promotional money spent along time ago. Now when I look at the bands that are drawing large crowds touring today they are generally bands that were promoted earlier than 1999. I suspect if you look at current incomes of musicians you will see there is a huge divide between the pre 1999 promoted and post 1999 bands. If you want to honestly look at how bands have done since the lawless internet arrived you cannot take data from musicians that have been promoted back in the days from record sales. Because even their current revenues from live shows would never have occurred if it not been for promotional money spent decades earlier – which came from record sales. The fact is that very few bands have been able to make it off the ground after 1999. Obviously record labels do not want to invest promotional money in bands when people will get the recorded music any way other than buying it. And self promotion makes for a nice children's story but it doesn't really happen. Of the few bands that did make it you can see a troubling practice of bands resorting to corporate patronage. That is they are accepting their promotional money by selling music to advertise goods. A band that sells SUV's cannot sing about global warming. A band that sells clothes cannot bad mouth consumerism in their lyrics. Of course there always have been bands that would be willing to sell goods to add income. Today however they have to do it to exist. In my book that scenario is a Creative Apocalypse all by itself. How about taking that in to consideration when you assess the current environment for musicians? Submitted by Donald Swearingen (not verified) on August 31, 2015 - 8:09pm. Johnson writes " From 2002 to 2012, the number of businesses that identify as or employ ‘‘independent artists, writers and performers’’ (which also includes some athletes) grew by almost 40 percent, while the total revenue generated by this group grew by 60 percent, far exceeding the rate of inflation." This statement reveals a completely erroneous interpretation of the statistics, one that any one with elementary mathematical skills should be able to spot. If the revenue for a group increases by 60%, that's a factor of 1.6. If the size of the group increases by 40%, that's a factor of 1.4. Now 1.6/1.4 = 1.14. That is, a 14% increase in income per member of the group. According to the Bureau of Labor Statistics Inflation Calculator (http://www.bls.gov/data/inflation_calculator.htm), $1.00 in 2012 had the same buying power as $1.28 in 2012. That's an inflation of 28% during that period, compared to the 14% rise in income for the music group. So, rather than far exceeding the rate of inflation, the music group is struggling to keep up with half the rate of inflation. Perhaps the rapture-like illustration on the cover of the Sunday Magazine showing the creative class rocketing to the sky should be amended to show the far greater number left behind and struggling to stay afloat without lifejackets. Submitted by kevin on September 1, 2015 - 11:20am. Good eye! Of course, that is a 14% increase in revenue per business, not per individual earner. It doesn’t tell us how employees are faring. We already pointed out that the employment numbers in this category have fallen in the business census. Johnson sets these numbers aside, calling them an “entourage” which is pretty weird; it’s a group that does contain lots of musicians, backing bands, sidemen, etc. But your overall point, that Johnson’s use of this data point is specious—is right on.